In 1992, at a Christie's auction in Geneva, a drop-shaped gray pearl known as the "Sara Pearl"was sold for $470,600. The pearl, that was believed to have an unknown historical provenance, had a weight of 55 carats, equivalent to 220 grains. It is not known how the pearl acquired the name "Sara. "Perhaps it was a reflection of the name of a previous owner of the pearl. At the beginning the origin of this pearl was a mystery. However, it did not take long for researches and jewelry historians to established the identify of this pearl, given the limited number of large pearls known in history, and the characteristics of the pearl, such as its shape, weight etc. They found that this pearl of unknown origin was actually the pear-shaped pearl of 55 carats (220 grains), which Tavernier, the renowned jeweler and traveler sold to Saista Khan, the Governor of Bengal and the uncle of Mughal Emperor Aurangzeb, during his last voyage to India, between 1664 and 1668. According to Tavernier, the pearl was of large size and good shape, but deficient in luster, and was discovered off the coast of the Island of Margarita, in Venezuela. Jean Baptiste Tavernier in his book, "Travels in India,"published between 1676 and 1679, gave sketches and descriptions of five of the main pearls, he had the privilege of examining personally during his travels. One of these pearls, which was Figure 3 in his sketches, actually belonged to him, and he purchased it either in Paris or one of the cities of the west. He was aware that the pearl originated in Venezuela, and he sold the pearl to Saista Khan. In his book Tavernier wrote, that this pearl was the largest ever carried from the occident to the orient. The pearl which Saista Khan owned, eventually found its way back to the west, after the fall of the Mughal Empire, and came into the possession of a pearl enthusiast or collector, also earning its new name "Sara Pearl." Thus, the names Sara Pearl/Tavernier Pearl/Shaista Khan Pearl are all synonymous, reflecting the names of the one time owners of this historic Venezuelan pearl. Comparison of the shape and weight of the pearl as described by Christie's auction house and by Tavernier in his book "Travels in India"
When the pearl first appeared at the Christie's auction in Geneva in 1992, it was described as a drop-shaped, gray pearl, weighing 55 carats, equivalent to 220 grains. Tavernier's representation of the pearl as a sketch, which was figure 3, on the diagram in his book "Travels in India,"appears to be a pear-shaped pearl, and was stated to have a weight of 55 carats (220 grains). The pear-shape of the pearl can be taken to mean a pear-shaped drop pearl. Thus, there is no significant difference in the description of the shape of the pearl by Christie's auction house and Tavernier's account in his book. The weight of 55 carats, equivalent to 220 grains, exactly tallies in both accounts, providing the strongest evidence for their single identity. The occurrence of large pearls is a rarity in pearl oysters, but the occurrence of two large pearls of the same weight is an extreme rarity. Furthermore, the occurrence of two large pearls of the same weight, and having the same shape, is a near impossibility. Comparison of the color of the two pearls ? Tavernier, described the pearl as having a large size and good shape, but deficient in luster. Unfortunately, Tavernier has not mentioned in his book about the color of the pearl. Christie's auction house described the pearl as a drop-shaped "gray"pearl. It is not known whether Tavernier's reference to a deficiency in luster was another way of referring to its gray color. Yet, researches seem to be fairly certain, that the drop-shaped gray pearl weighing 55 carats (220 grains), and of unknown historic provenance, is the same pearl referred to by Tavernier in his book, "Travels in India"and which he sold to Shaista Khan for an undisclosed amount. In the table of famous nacreous drop-shaped pearls arranged in descending order of weights the Sara/Shaista Khan Pearl occupies the 9th position. In other words it is the 9th largest drop-shaped pearl in the world. The Sara/Tavernier/Shaista Khan Pearl occupies the 5th position in the table of famous nacreous pear-shaped drop pearls, arranged in descending order of weights. This means that the pearl is the 5th largest pear-shaped drop pearl in the world. Tavernier in his book "Travels in India"states, that the pearl which he sold to Shaista Khan originated from the Island of Margarita on the Venezuelan coast, and was the largest ever carried from Occident to Orient. His assertion without any doubt is the real truth, as Tavernier was the only professional jeweler in the 17th-century, who had been shuttling between the east and west, carrying valuable gemstones like diamonds, pearls and colored stones from the east to the west on his return journeys, and pearls and emeralds discovered in the New World that reached Europe in large quantities in the 17th-century, from the west to the east, on his subsequent journeys. The Venezuela pearls were first discovered by Columbus in 1498, during his third voyage to the New World, around the off shore island of Cubagua, which he christened the "Island of Pearls. "After subsequent expeditions by the Spanish, the Cubagua pearl fishery attained great fame, that led to the establishment of the first Spanish town in the New World in 1515, called New Cadiz, based on the Cubagua Island. New Cadiz served as a center for harvesting pearl oysters and collecting pearls. However, freshwater needed by the settlers had to be brought either from the mainland, twenty miles away or from Margarita Island, three miles further northwards. Subsequently, pearl banks were also discovered off the coast of the Islands of Margarita and Coche, which were also exploited. Thus, the natural pearl industry of Venezuela was mainly centered around the three off shore islands of Cubagua, Margarita and Coche, around 20 miles off its northeastern Caribbean coast, which came to be known as the "Pearl Coast. "The natural pearl industry of Venezuela lasted until around the mid-17th century, when the oyster resources became scarce due to overexploitation, and was finally abandoned. Thus, the Sara/Tavernier/Shaista Khan pearl was discovered in Venezuela, before the mid-17th century (1650), when the industry was abandoned. In all probability, the pearl was taken by Tavernier to India during his last voyage which started in 1663, and eventually sold to Shaista Khan in 1666. The oyster species around which the natural pearl industry of Venezuela was based, was the Atlantic pearl oyster, Pinctada imbricata, which modern research has shown to be closely related to the Gulf pearl oyster and Ceylon pearl oyster, Pinctada radiata and the two Indo-Pacific pearl oysters, Pinctada fucata and Pinctada martensii (Akoya pearl oyster). Today, all these species of pearl oysters are considered to be one and the same species, Pinctada radiata and the names imbricata, fucata and martensii are referred to as synonyms of the same species. The average size of the pearls produced by Pinctada imbricata was between 2 to 5 carats (8 to 20 grains), and three main color grades of pearls were harvested : white, yellow and pink. Apart from this there was a range of other colors such as brown (bronze), gray and occasional black pearls. Large quantities of seed pearls were also produced by Pinctada imbricata. Rarely, pearls of large sizes, some exceeding over a 100 carats (400 grains) have also been produced. Thus, the 55-carat (220-grain), gray, pear-shaped drop pearl, the Sara/Tavernier/Shaista Khan Pearl, without any doubt also originated in the pearl oyster species, Pinctada imbricata. Other significantly large pearls that are believed to have originated in Venezuela are, the 126-carat (504 grains) Gogibus pearl, and the 33.29-carat (133.16 grains) La Pelegrina Pearl. 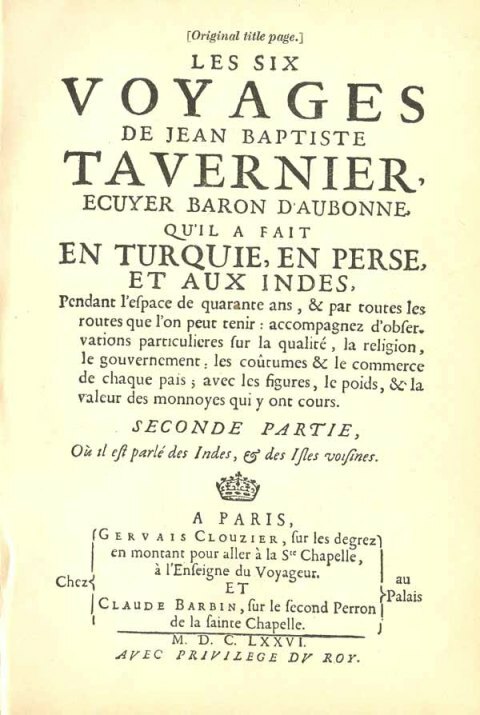 Jean-Baptiste Tavernier was the most renowned French traveler of the 17th-century, who made six voyages to the east during his life time, and combined his desire to travel and explore new countries and cultures, with his personal business interests to buy and sell gemstones, such as diamonds, pearls, emeralds, rubies and other colored stones and jewelry. Tavernier became one of the pioneers of trade between the West and countries of the East, such as India and Persia. However, his greatest contribution to human advancement during this period, was the knowledge he brought home to the people of Europe, about countries which had previously been but little known, through the publication of his travelogues, such as a Nouvelle Relation de l'IntÃ©rieur du SÃ©rail du Grand Seigneur -New Account of the Interior of the Grand Serail Lord (Paris, 1675), based on two visits to Constantinople in his first and sixth journeys, followed by Le Six Voyages de J. B. Tavernier- The Six Voyages of J. B. Tavernier (2 vols. Paris, 1676) and his last Recueil de Plusieurs Relations -Several European Relations published in 1679. The first page of the original French edition of Tavernier's "Les Six Voyages De Jean Baptiste Tavernier"
The zeal which I have for the service of your Majesty, and for the honor of France, does not permit me to enjoy the repose which I believed had come to me after such prolonged labors. My age not permitting me to undertake new voyages, I have experienced a kind of shame at finding myself of no use to my country, and at not acquitting myself of all which it expects from me. I have thought it to be my duty to it to render an account of my observations upon that which I have seen, and have not been able to excuse myself from making public. I hope, Sire, that these exact and faithful accounts which I have written, since my return, from the notes which I have collected, will not be less useful to my country than the valuable articles of merchandise which I have brought back from my travels. For my object in this work is not merely to assuage public curiosity. I have proposed for myself a more noble and more elevated aim in all my deeds. As the hope of legitimate gain alone has not made me traverse these regions, so the sole desire of placing my name in this book has not caused me to-day to have it printed. Tavernier was born in Paris in the early 17th-century, but his date of birth is not exactly known, as the registers of the Church of Charenton, where he was baptized was not available for the period he was believed to have been born. However, the year of his birth has been ascertained from a statement in his third publication "Recueil de Plusieurs Relations - Several European Relations"published in 1679, according to which he was 74 years old in 1679. Thus his year of birth is believed to be 1605. Tavernier's father Gabriel is believed to have fled from Antwerp to Paris in 1575, together with his brothers Melchior and Nicolas, in order to escape the religious persecution of protestants. Melchior and Gabriel were geographers, and became professional cartographers and engravers to the King. Gabriel married Suzanne Tonnelier by whom he had three sons, Melchior born in 1594, Tavernier born in 1605 and Gabriel born in 1613. The geographical surroundings in which Tavernier grew up, and the intellectual discussions to which he was exposed at a very young age, kindled in him a strong desire to see foreign countries. According to Tavernier, as stated in the section "Design of the Author"in his book "Le Six Voyages de J. B. Tavernier,"at the age of 22 years he had seen the best parts of Europe - France, England, Holland, Germany, Switzerland, Poland, Hungary and Italy - and was able to speak several European Languages. After traveling through Europe for 6 to 7 years, he was then eager to visit the east. Tavernier, who was now 26 years old, sought the help of Pere Joseph, Cardinal Richelieu's agent, and joined two French travelers, M. de Chapes and M. de St Liebau, who were on a mission to the Levant. With them he reached Constantinople in early 1631, where he spent nearly 11 months, before proceeding by Tokat, Erzerum and Erivan to Persia. The farthest point he reached on this first journey was Isfahan in Persia, from where he returned back to Europe, via Baghdad, Aleppo, Alexandretta, and then took a ship to Italy via Malta, and reached Paris overland in 1633. Tavernier undertook his second voyage in 1638, at the age of 33 years. He set off from Paris on September 13, 1638, and boarded a ship at Marseilles for Alexandretta, an important port city in the Mediterranean in Turkey, which in ancient times was the main outlet for overland trade routes from Baghdad, Persia and India. The British Levant Company maintained an agency and factory here for 200 years from 1625 to 1825. This time apart from himself there were three others in his team, a young artist, a surgeon and his brother Daniel. According to Dr. Valentine Ball the Author of "Travels in India by Jean-Baptiste Tavernier"a translation of the original French edition of "Le Six Voyages de J. B. Tavernier,"published in 1676, on his second voyage Tavernier was well equipped as a merchant. From Alexandretta he proceeded to Aleppo, the Ottoman Empire's 3rd-largest city after Constantinople and Cairo. He spent about 6 weeks at Aleppo and on December 27, left with a caravan to Isfahan, passing through Mashhad, Basra, Shiraz, and reaching Isfahan in May 1639. At Isfahan, Tavernier had the privilege of having an audience with the King Shah Sufavi, the grandson of Shah Abbas. From Isfahan he moved on to India, but it is not known whether he reached India overland or by Sea. He mentions in his book the cities of Surat, Agra, Burhanpur, Goa and Golkonda as cities he visited in this voyage. Thus it appears that from Isfahan he traveled southwards to the coastline of Persia, and probably from the ancient port city of Bandar Abbas took a ship to the port city of Surat in India. In 1640, he took the Ahmedabad route from Surat to Agra, the capital city of the mighty Mughal empire, where he had the privilege of an audience with Mughal Emperor Shah Jahan. His return journey from Agra to Surat was via Burhanpur in 1641. He then moved southwards to Goa, a Portuguese colonial territory that came under their control in 1510 after the defeat of the Bijapur kingdom. From Goa he traveled northeast and through Bijapur reached Hyderabad, the capital city of the Qutb Shahi Kingdom founded in 1591. Hyderabad was still under Qutb Shahi rule when Tavernier visited the city in 1642. From Hyderabad he traveled eastwards reaching Golconda, the region that had the only known diamond mines in the world, at that time. He visited several diamond mines in Golconda, and may have made some purchases, but significant purchases were made by him only during subsequent visits. By the end of 1642, he reached Surat again, from where he reached Bandar Abbas by the sea route, at the beginning of 1643. From Bandar Abbas he reached Paris again, probably by the land route that brought him to a seaport in the Mediterranean, from where he took a ship back to Marseilles. He was already in Paris by late 1643, and within a short period was ready for his third voyage. Tavernier undertook his third voyage on December 6, 1643 when he was 38 years old. The primary purpose of this voyage appears to be the purchase of diamonds from the renowned Golconda mines, after his previous exploratory trip to the region, during his second voyage. Setting off in December from Marseilles he follows essentially the same route as his second voyage, reaching Alexandretta by ship, and then through Aleppo reaching Isfahan on May 3, 1644. After spending some time in Isfahan. he reaches Surat in January 1645, via Bandar Abbas. Then on January 16, 1645 he began his journey to Golconda, via Daulatabad and Nander. Reaching Golconda, he first travelled to the diamond mines at Raolconda, eighteen miles south of Karnal. From Raolconda he returned to Golconda again and moved towards the mine which he called Gani or Coulour. This is obviously a reference to the famous Kollur mines situated on the banks of the Kistna River, southeast of Golconda. He then appears to have moved northwards to the Sambalpur mines, the most ancient diamond mines in India, on the Mahanadi River, believed to be the diamond river mentioned by Ptolemy in A. D. 60 t0 90, situated in East Central India and flowing through the modern Indian States of Chhattisgarh and Orissa. However, no dates are mentioned about the visit to these mines. By the end of the year 1647, he appears to have been in Isfahan in Persia, having left India earlier. But, again on January 11, 1648, we find him back in India at Mingrela (Vengurla), on the west coast of India, having arrived from Surat in a Dutch ship called the Maestricht. He enjoyed the hospitality of the Dutch authorities at Mingrela for over a week, and then boarded a ship to Goa where he arrived the next day. He was treated with kindness by the Portuguese authorities of Goa, where he remained for 2 months. He returned to Vengrula on March 11, 1648, where he stayed for about a month before embarking on a Dutch ship bound for Batavia (Jakarta) in Java, Indonesia. The actual purpose of visiting Batavia was to meet his brother Daniel, whom he had not seen for 10 years. On this voyage, Tavernier escaped shipwreck off the coast of Malabar, but was lucky in reaching the port of Point de Galle (Galle) in Ceylon (Sri Lanka), a country that was colonized by the Dutch at that time. Tavernier was well received by the Dutch in Galle, where he remained till June 25th, 1648, when the merchandise in the damaged ship was transferred to another vessel and the voyage continued. After around 3 weeks on July 17, the coast of Sumatra was sighted, and on the July 22, 1648, Tavernier reached Batavia. While at Batavia, Tavernier went on two short visits to Bantam, a trading city in the western end of Java, under the Bantem Sultanate, where his brother Daniel was based. He was well received by the Sultan of Bantem, a close friend of his brother. Soon after he returned to Batavia, following his second visit to Bantam, his brother Daniel followed him to Batavia, where he fell seriously ill and died shortly afterwards, in spite of all efforts to save his life. In October 1648, Tavernier set sail from Batavia to Holland, in a ship called the "Provinces. "The ship sailed for the Cape of Good Hope, arriving there in 55 days, and remained there for another 22 days for the treatment and recovery of the sick. The ship then set sail to St. Helena, which it reached in 18 days, and where it remained for another 22 days. Finally the ship set sail to Holland, reaching it around April 1649, from where he found his way to Paris around May 1649. Tavernier spent the next two years in Europe. During this period he was busy trying to find prospective customers for the diamonds and other precious stones he purchased from India. He was also involved in a litigation with the Dutch Company to whom he surrendered Dutch pay-bills, which he had purchased at a discount, intending to sell them at par in Holland, a practice that was later prohibited. Tavernier surrendered his bills on the promise of an order for payment of his expenses in Holland, but this promise was never fulfilled. This was the cause that precipitated the legal action against the Company in Holland, that soured his relationship with the Dutch and created a lot of enmity towards them. Tavernier, started his fourth journey at the age of 46 years, leaving Paris on June 18, 1651, but actually setting sail from Marseilles on August 25, 1651, and via Malta and Larnaca in Cyprus, reached Alexandretta on October 4, 1651, the main transit point for travelers from Europe bound for Persia, China and India by the overland route. From Alexandretta as usual he proceeded to Aleppo, which he reached on October 7, 1651. However, due to civil disturbances in the Ottoman empire during this period, he was unable to proceed further, and was held up in Aleppo till the end of the year. Eventually he left Aleppo on the last day of the year, and passing through Isfahan reached Bandar Abbas in May 1652. On May 11, 1652, he boarded a ship belonging to the Qutb Shahi king of Golconda, which was bound for the port of Masulipattinam, on the east coast of India. The ship reached Masulipattinam on July 2, 1652, where he disembarked with his friend M. du Jardin, and proceeded to Gandikot via Madras. They reached Madras on August 13, 1652, where he made friends with the English Governor and his men based in Fort St. George, the first British Fortress in India. He also visited the Portuguese Governor and the Catholic priests at San Thome, at Mylapore in Madras, the site of the famous Santhome Cathedral Basilica, claimed to have been built over the tomb of apostle St. Thomas. He left Madras on August 22, 1652, traveling along the valley of the Penner River to Gandikot. He reached Gandikot on September 1, 1652, whose Fort had just been captured by Mir Jumla, the commander of the army and prime minister, on behalf of the Qutb Shahi King of Hyderabad. Tavernier made a courtesy call on Mir Jumla in order to establish an acquaintance with the celebrated General, and through him get an introduction to the court of the King of Golkonda (Hyderabad). He showed the General, the pearls and precious stones which he proposed to sell to the King. Tavernier took leave of Mir Jumla on September 15, 1652, having received an assurance of recommendation to his son at the Qutb Shahi court. He traveled northwards and reached Golkonda on October 2, 1652, where as promised he was given access to the court, and was able to show his merchandise to the King. Negotiations were begun for the sale of the precious items but soon broke down due to an offending remark made by an aide to the King that Tavernier's prices were too high. Tavernier then left Golconda for Surat on October 15, 1652 together with his friend M. du Jardin. He reached Surat on November 5, 1652, where unfortunately his companion M. du Jardin died. Tavernier, then traveled to Ahmedabad to meet Shaista Khan, the Moghul governor of Gujarat, who had invited him to bring his jewels. From Ahmedabad he returned to Surat, and set out for Golconda for a second time on March 6, 1653, by the Aurangabad route, reaching Golconda on April 1, 1653. He then visited the diamond mines of Golconda again, possibly to purchase more rough diamonds, and returned to Surat before the end of the same year. At Surat, he learnt that war had been declared between England and Holland. Tavernier, then set sail in one of a fleet of five Dutch naval vessels on January 8, 1654, dispatched from Surat to intercept an English fleet that was expected to be back on its way from Hormuz. A naval engagement ensued in which the English fleet was destroyed, and the Dutch fleet then proceeded to Bandar Abbas, reaching there on March 7, 1654. Tavernier, then disembarked and made his way to Isfahan, via Kerman, where he purchased large quantities of beautiful wool for which the region was famous for. After reaching Isfahan, where he stayed for over an year, visiting places which previously he had not seen, he returned to France via Aleppo and Alexandretta, by the autumn of 1655. Tavernier, again rested for around two years, during which period he disposed of the rough diamonds purchased from Golconda, and perhaps other gemstones he purchased during his trip to India. He was 52 years old when he started on his fifth voyage from Paris in February 1657. However, unlike other voyages, right on the first-leg of his tour he ran into difficulties, when the ship he took from Marseilles to Alexandretta was chased by pirates in the Mediterranean. They were forced to take refuge in a port near Toulon, where Tavernier disembarked carrying in his person the jewels which he wanted to sell in the east, but allowing his heavier merchandise to be carried in the same vessel. He returned by land to Marseilles from where he took an English ship for Italy. While in Italy he visited Duke Ferdinand II of Tuscany, who welcomed him and treated him with great respect and kindness. From Italy he sailed for Smyrna in a Dutch ship. Smyrna was an ancient port city in the Aegean coast of Anatolia, which is now in Turkey and known as Izmir. Smyrna like Alexandretta was a buzzing commercial center and the main entrepot for goods passing from Europe to Asia and vice versa. While awaiting the departure of his caravan, Tavernier sent one of his servants to Constantinople to buy pearls from a Jewish dealer residing there. He knew by experience that pearls were the best articles of trade which could be taken to India. In June 1657, Tavernier began his overland journey from Smyrna to Isfahan through Erivan (Yerevan) in Armenia and Tabriz, in northwest Iran. After reaching Isfahan, Tavernier heard about the unsettled conditions in India, following the usurpation of the Mughal throne from Shah Jahan by his son Aurangazeb, who placed his father under house arrest in his palace in Agra. Tavernier postpones his departure from Isfahan till the beginning of 1659, but before setting sail for Surat, he dispatched most of the beautiful objects and curiosities he purchased for Shaista Khan in Europe, under the care of one of his servants to Masulipattinam, on the east coast of India. He also dispatched a letter to Shaista Khan informing of his intended arrival in Surat. He reached Surat in May 1659 and waited for a reply to his letters. Shaista Khan was a trusted general in the Mughal army and an uncle of Emperor Aurangzeb. He was moved at very short notice from one trouble spot to another during Aurangzeb's rule. Thus, Tavernier had considerable difficulty in meeting him. At first he sent a letter and a passport to Tavernier asking him to meet him at Jahanabad. Then other letters followed asking him to come to Burhanpur and later Aurangabad. Then when he was about to leave for Aurangabad, the Governor of Surat stopped him saying that Emperor Aurangzeb had already been informed of his arrival, and will not be allowed to leave until permission was granted by the emperor. Tavernier contacted Shaista Khan who ordered his immediate release. Eventually Tavernier left Surat after a six months delay in November 1659, and was directed to proceed to Chakan (Choupar) in the Deccan, where he finally met Shaista Khan laying siege to the city. After concluding the business transactions with Shaista Khan, Tavernier again moved southwards, to visit the diamond mines of Golconda again. It was during this visit, in 1660, that he is believed to have purchased the famous blue diamond known as the "Tavernier Blue Diamond,"or "French Blue Diamond"that came to be known as the "Hope Diamond" which was originally 112 carats, but later cut and transformed into a 67.50-cart triangular pear-shaped brilliant, and re-cut again in 1812 to a 44.50-carat, cushion-cut blue diamond, in which form it is preserved today, at Smithsonian Institution's National Museum of Natural History. By the end of 1660 or beginning of 1661, Tavernier reached the Dutch outpost at Vengrula on the west coast of India, from where he boarded a ship to Bandar Abbas in Persia. He remained in Persia till 1662, and in the same year returned to Paris. Tavernier was now 57 years old and had amassed a considerable fortune. He had been on the move since the age of 15, and had hardly any time as a traveler, to marry and settle down in life. Finally he decided to get married for the first time in his life in 1662, and it was believed he would take rest from his travels. His wife was Madeline Goisse, daughter of Jean Goisse, a Parisian jeweler with whom he had had previous business dealings and was related to his brother Melchior. Tavernier who enjoyed married life for about an year was soon struck by the travel itch again, and had expressed a desire to do a final trip to the east in order to wind up all his affairs there. Eventually this desire materialized into another full-scale business trip in which he purchased the much-needed merchandize from the west, sought-after in the East, including gemstones and pearls. Tavernier who was now 58 years old, set off from Paris on November 27, 1663, and was accompanied by five assistants, one of whom was his own young nephew, the son of Maurice Tavernier. The other four were experts in their own chosen professions, such as a surgeon, a goldsmith and a horologist. The value of the precious stones and jewelry he carried was estimated to be 400,000 livres, which was equivalent to 30,000 British pounds. The route that he took on the first-leg of this last tour, was the same as the fifth tour, in which he embarked from Marseilles on January 10, 1664, to the Anatolian port city of Smyrna, reaching his destination on April 25, 1664. He remained in Smyrna until June 9th, 1664, when he and his team set off with a caravan for Tabriz in northwest Persia, via Erivan (Yerevan) in Armenia. The caravan reached Erivan after three months on September 14, 1664 and Tabriz on November 9, 1664. Unfortunately, two of his assistants, the goldsmith and the watchmaker died while in Tabriz, possibly of sickness precipitated by the fatigue of the long journey. Tavernier, who was worried about the health of his young nephew, Pierre, left him at Tabriz, in charge of the Superior of the Capuchin Convent. Tavernier then left with the remaining two members of his team to Isfahan, on November 22, 1664, his principal merchandise having preceded him before he embarked on the journey. They reached Isfahan on December 14, 1664. Shah Abbas II, on hearing of his arrival in Isfahan, summoned him to the court, to appear before him with his precious merchandise. Shah Abbas II had previously purchased some jewels from him during his 5th onward journey to India in 1657. As was the custom at that time, Tavernier carried a valuable gift to the Emperor, in the form of a large metallic mirror. After the exchange of greetings, Shah Abbas inquired from Tavernier, as to whom he had sold the precious stones which he carried during the previous journey. Tavernier replied that it was to Shaista Khan, and that the General had paid him a sum of Rupees 120,000 for the transaction. Negotiations then began for the sale of the precious stones and jewelry to the Emperor, which he eventually purchased at prices demanded by Tavernier, except for the pearls. The total value of the transaction concluded was 3,900 tomans, equivalent to 13,455 British pounds. Shah Abbas II, who was pleased with the transaction conducted with Tavernier, bestowed on him a special honor, by awarding him a robe of honor with a mantle and granting him many favors such as the right to sell his goods in Persia, free of duty, a promise for a good reception for all Franks arriving in Persia and special protection granted for his nephew left behind in Tabriz. 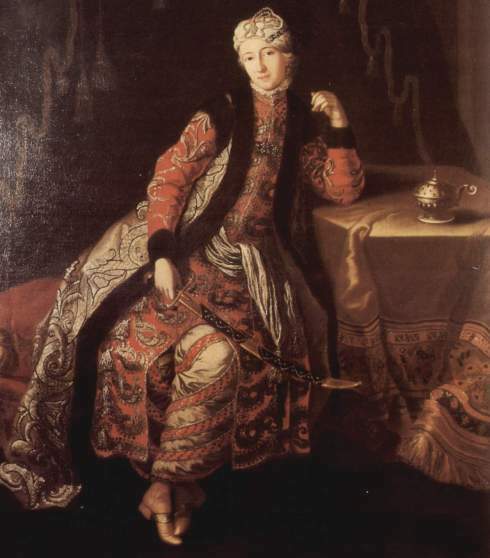 A portrait of Tavernier, appearing in his third publication, Recueil de Plusieurs Relations - Several European Relations published in 1679, show him wearing the robe of honor and mantle, presented by Shah Abbas. The Shah also placed additional orders for jewelry based on designs drawn by the Shah himself, to be executed in gold, enamel and precious stones, and delivered during his next journey. 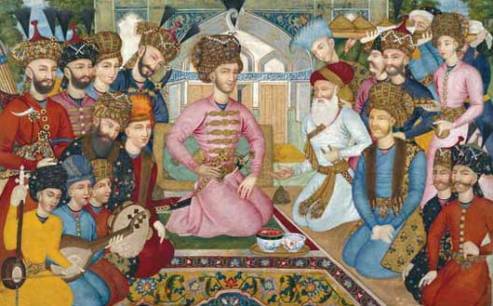 1663 Painting of Shah Abbas II's Court, showing him with the Mughal ambassador. Tavernier left Isfahan for Bandar Abbas on February 24, 1665, and reached the southern port city in the first week of April. From Bandar Abbas to Surat he left by a Dutch ship, reaching Surat on May 5, 1665. While at Bandar Abbas, Tavernier was entrusted with an important packet of letters by the English resident to be delivered to the English authorities in Surat. These highly confidential letters were believed to have contained information on the outbreak of war in Europe, and was stolen by the Dutch in transit, and replaced with some blank papers. Tavernier earned the wrath of the English authorities in Surat when they discovered that the letters had gone missing, and nearly escaped death at the hands of the English. He lodged a strong protest against this deception, with the Dutch General at Batavia, threatening to inform the Shah of Persia about the uncivilized behavior of the Dutch operating from Bandar Abbas, and to pursue further action after reaching France. This incident further aggravated Tavernier's enmity towards the Dutch, after he was cheated for the first time in 1648 at Batavia, by forcing him to surrender Dutch pay-bills. These were the reasons that led him to write his exposures of Dutch behavior, in "The History of the Conduct of the Dutch in Asia,"in his 1679 publication Recueil de Plusieurs Relations - Several European Relations. After arriving in Surat, the Mughal Governor of Surat informed Tavernier, that Emperor Aurangzeb would like to inspect his jewels first, with a view of purchasing them, before any others in the country were shown the jewels. However, Tavernier had already promised Shaista Khan, that the jewels would be first shown to him, before it was shown to others. Tavernier, had learnt that Shaista Khan was now the Governor of Bengal. Thus, Tavernier would have very much liked to proceed to Bengal first, but since the request had come from the mighty Mughal Emperor himself, he was obliged to comply and proceeded instead to Agra and then Jahanabad, where the Emperor's palace was based. On September 12, 1665, he reached Jahanabad, and then visited the palace, carrying with him valuable presents for the Emperor and his nobles. 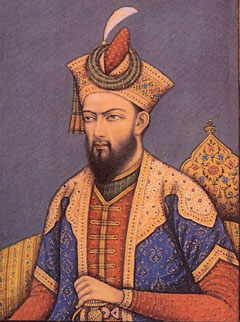 Emperor Aurangzeb, who was impressed by some of the jewels shown to him, purchased them from Tavernier. He was also able to sell several precious stones to Ja'far Khan, the uncle of the emperor. However, the price of a large pearl which Tavernier wanted to sell to Ja'far Khan, was disputed by him, who wanted to buy it at Rupees 10,000 less than the quoted price. This pearl was eventually purchased by Shaista Khan, at Dacca, which gives rise to the speculation, that this pearl is probably the 55-carat (220-grain), drop-shaped, gray pearl, which is the subject of this webpage. Tavernier remained in Jahanabad for nearly two months, and on November 1, 1665, when he visited the Emperor, to take leave of him, Aurangzeb pressed him to remain for some more time, in order to witness his annual festival, which was to take place on November 9, 1665. The Emperor also promised Tavernier that if he decided to remain, soon after the festival was over, he would be given the rare privilege of seeing all his crown jewels. Tavernier, accepted the offer without any hesitation being a once-in-a-lifetime chance to inspect the crown jewels of the mighty Mughal Emperors. His decision, subsequently gave us a first-hand report of the Mughal jewels, as seen by a Westerner's perspective, that not only provided some of the most interesting chapters in his entire travels, but also important information about the valuable treasurers in the Mughal treasury. After the conclusion of the annual festival, Aurangzeb kept his promise, and showed him the jewels in the treasury, on the following day, November 10, 1665, that also included the famous diamond known as the Great Moghul Diamond. Soon after that Tavernier took leave of the emperor and left for Agra, where he remained until November 25, 1665. He then accompanied by two other Frenchman, Bernier, a physician and Rachepot, set off for Bengal, to meet the Governor Shaista Khan. They reach Allahabad on December 7, 1665, and after crossing the Ganges, followed its left bank, arriving at Benares on December 11, 1665, where they remained for two days. Subsequently they followed the right bank of the river to Patna, which they reached on December 20, 1665. The party spent eight days in Patna and set off again on December 29, passing down the Ganges and reaching Rajmahal on January 4, 1666. Two days later Bernier left them and went to Kasimbazar, but Tavernier proceeded to Dacca, reaching his destination on January 13, 1666. On the following day he kept his appointment with Governor Shaista Khan giving him valuable presents. Shaista Khan inspected the goods that were brought for him by Tavernier, that included the large pearl that Ja'far Khan was not able to buy at Jahanabad. Apparently satisfied with what he had seen, he gave an order for payment from the Mogul treasury in Kasimbazar. Having received the order for payment, Tavernier, left Dacca for Kasimbazar on January 29, 1666, reaching his destination on February 12, 1666. He presented the order for payment to the Mogul treasurer, and to his utter shock and disbelief, he was informed by the treasurer, that three days ago he had received an order from the Governor, to stop payment on the order. Subsequently, further instructions were received from Dacca, that the treasurer should pay 20,000 rupees less on the previously agreed amount. Tavernier's options were now limited, and he chose to accept the new offer, and prepared for his return journey back to Paris. Tavernier attributes Shaista Khan's unexplained behavior to the machinations of Aurangzeb's officers for not having sold the jewels to them at cheaper prices, so that they could resell them to the emperor at enhanced prices. Tavernier remained in Patna, during the month of June and July, and reports that on July 2, 1666, he witnessed an eclipse of the sun. During his stay in Patna, he probably visited the ancient Sambalpour diamond mines. He reached Agra in August 1666, from where he proceeded to Surat, reaching it on November 1, 1666. He remained in Surat, till February 1667, when he embarked for Bandar Abbas. From Bandar Abbas he traveled to Isfahan, where he stayed till the end of the year 1667. From Isfahan he moved to Tabriz in the northwest of Persia, where he probably saw his nephew, who was left in the care of the Superior of the Capuchin Convent. Then through Yerevan in Armenia he entered Turkey, and eventually reached Constantinople (Istanbul), in the early part of 1668. He remained in Constantinople till the end of the year, eventually reaching Paris on December 6, 1668. Tavernier was now 63 years old, and the seasoned traveler, who had been on the move for over 40 years, finally decided that he had traveled enough and accumulated a great fortune, and it was now high time for him to settle down permanently and enjoy the fruits of his labors. After his final return to France in December 1668, Tavernier was granted a special audience by the Sun King, Louis XIV, who was very anxious to meet such a renowned traveler, who had been on the move for a greater part of his life, making the acquaintance of powerful monarchs, the nobility and generals of the army, of the distant lands of the east, and also served as an unofficial roving ambassador for France, racing the profile of its citizens, granting them special status and treatment whenever they visited these lands. Tavernier success story was no doubt due to his ability to combine his business interests with his traveling, and on this occasion too he did not fail to advance his business interests, when he offered a large number of diamonds, which perhaps included the famous "Tavernier Blue Diamond"or "Hope Diamond"and other precious stones, for sale to the King. The King gladly purchased all his diamonds and precious stones. Further as a token of gratitude for his eminent services to France, in February 1669, the King also granted him letters that conferred upon him a title of nobility. The following year, in April 1670, he purchased the Barony of Aubonne, near Geneva, and after taking oaths was received by their Excellencies of Berne, as "Seigneur Baron d’Aubonne"Tavernier, restored the castle at Aubonne, introducing oriental decorations. It was in the comfort of this restored castle that he prepared his notes for publication. Tavernier, had been writing extensive notes while he was on the move, and shortly after the time the events took place. However, Tavernier was not educated enough to organize all his notes and present them in the form of a book. He was assisted in this effort by authors like Samuel Chappuzeau, who helped him produce the first two publications, Nouvelle Relation de l'IntÃ©rieur du SÃ©rail du Grand Seigneur in 1675 and two volumes of Le Six Voyages de J. 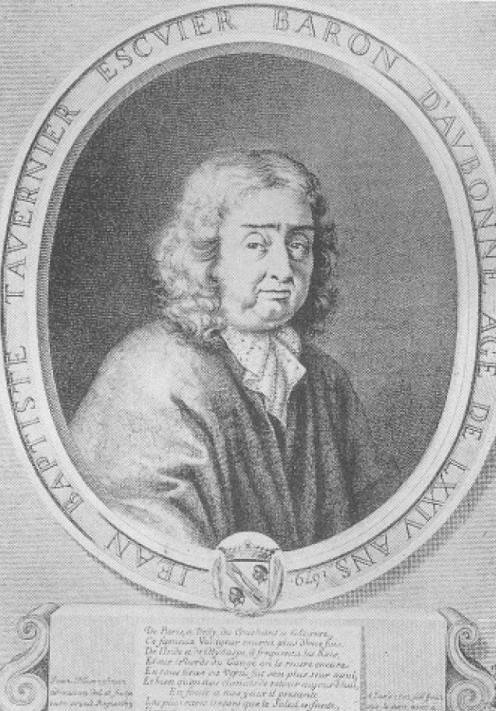 B. Tavernier in 1676, and La Chapelle who assisted him in producing his 3rd publication, Recueil de Plusieurs Relations in 1679. The 3rd publication also includes a critical attack on the agents of the Dutch East India Company, at whose hands he suffered several wrongs. In 1679, the life of Protestants in France became miserable, as King Louis XIV began undermining his Protestant subjects, and rewarding Catholic converts by establishing the Bureau of Conversion. In 1684, Elector Fredrick William of Brandenburg, sought Tavernier's advice on the setting up of his own East India Company. The elector wanted to utilize Tavernier's vast trading experience and contacts with the countries of the East, in launching his own trading company, and Tavernier traveled to Berlin at the elector's invitation, to work on this proposed scheme. According to this plan three armed vessels were to be purchased for the company, and Tavernier was to be appointed as Ambassador, and Chamberlain to the elector and Counselor of Marine. Tavernier spent six weeks in Berlin and after concluding negotiations with the elector, visited several cities in Germany and Holland, before returning to Aubonne in November 1684. The oppression of Protestants in France was now becoming more and more severe, and the offer of the elector of Brandenburg seemed to be timely for Tavernier to get away from it all. In January 1685, he sold the land and barony of Aubonne to the Marquise Henri du Quesne for 138,000 livres, and an extra 3,000 livres being paid for the horses and carriage. As Tavernier waited for further instructions from Berlin, it transpired that the elector's ambitious plans to set up his own trading company, was finally abandoned. In October 1685, Louis XIV repealed the Edict of Nantes. Louis, then instituted the Verification of Nobility, which deprived non-Catholics of noble titles. In 1687, Tavernier left Paris for Switzerland, in spite of an edict prohibiting Protestants from leaving France. Little did he realize that this would be the last time he would be leaving his beloved country, never to return again. In 1689, he passed through Berlin and Copenhagen, and entered Russia on a passport from the King of Sweden, believed to be with the intention of traveling overland to India, a route which he had never taken before. 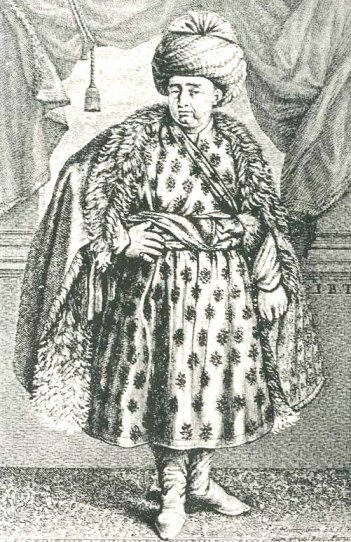 However, even before he could begin his journey, he fell sick, and died soon afterwards in Moscow, in July 1689, at the age of 84 years. It appears that he had still business relations in the East;but the true reason for the final journey of this indefatigable old man remains a mystery. Perhaps, his intention would have been to settle down in India or Persia, where there was peace and religious tolerance, that was seriously lacking in his own country. When was the 55-carat pear-shaped Sara Pearl/Tavernier Pearl/Shaista Khan Pearl sold to Shaista Khan ? Tavernier met Shaista Khan, uncle of Emperor Aurangzeb and a General in the Moghul Army on three different occasions, during his 4th, 5th and 6th voyages. During his 4th-voyage, he met Shaista Khan for the first time, at Ahmedabad in Gujarat, at his invitation, when he was Governor of Gujarat. Tavernier was at Surat in 1652, when he was invited by Shaista Khan to bring his jewels for inspection and possible purchase. This meeting took place between November 5, 1652 and March 6, 1653. It is not known whether any pearls were sold to Shaista Khan on this occasion. The second time Tavernier, met Shaista Khan was during his 5th-voyage, in November 1659, when he left Surat and proceeded to Chakan (Choupar) in the Deccan, where Shaista Khan was laying siege to the city. Tavernier sold all items which he brought for Shaista Khan, for which the General had placed an order during his previous meeting with him at Ahmedabad. It is not known whether any pearls were sold during this occasion. The third time Tavernier met Shaista Khan, was during his 6th and last voyage while he was the Governor of Bengal. Tavernier after meeting Emperor Aurangzeb and selling some jewels to the Emperor and his uncle Ja'far Khan, proceeded to Bengal, where he met Shaista Khan on January 14, 1666. Shaista Khan purchased all the jewels brought for him by Tavernier, including a large pearl, which previously Ja'far Khan was not able to purchase at Jahanabad, due to a dispute over its price. Out of the three occasions during which Tavernier met Shaista Khan, the sale of a large pearl to him has been mentioned only on the 3rd occasion, during his 6th-voyage, on January 14, 1666. Thus, in all probability it appears, that it is the 55-carat pear-shaped Sara/Tavernier/Shaista Khan pearl that changed hands during this occasion. Shaista Khan, who in his younger days was known as Mirza Abu Talib, was an able soldier in the Mughal army who distinguished himself in the battle field, and subsequently became a general in the army, earning a reputation as a successful military commander. In recognition of his services to the empire, he was appointed as Governor in different provinces, and finally as the Governor of Bengal from 1664 to 1688. During his 24-year period of rule in Bengal, Mughal power in the province attained its greatest heights, and Dhaka was transformed from a small township into a thriving and prosperous city, one of the largest cities in the Indian sub-continent. 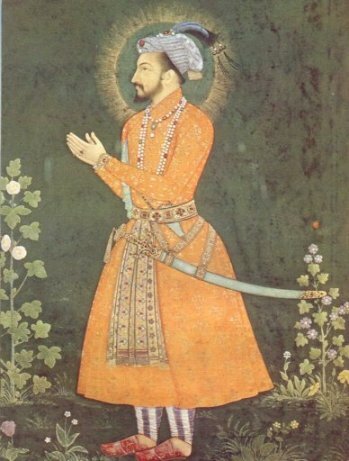 Born into a family of Iranian descent, Mirza Abu Talib was connected to the Mughal royal family. Both his father and grandfather served as prime ministers (waze'er) to the Mughal emperors. While his grandfather Mirza Ghiyas Beg served as waze'er to Emperor Jahangir, his father Asaf Khan served as waze'er to Emperor Shah Jahan. It was Emperor Shah Jahan, who awarded the title of "Shaista Khan"to Mirza Abu Talib, in recognition of his family's dedication, loyal service and their position in the Mughal court. Shaista Khan trained and served with the Mughal army, distinguishing himself on the battle field. Eventually he was appointed as a general in the Mughal army, in which capacity he earned a reputation as a successful military commander. In the war against the Qutb Shahi kingdom of Golconda, that eventually led to its capture, both Shaista Khan and Prince Aurangzeb fought side by side and became close to one another. In the battle for succession to the Mughal throne, that broke out between Aurangzeb and elder brother Dara Shikoh, Shaista Khan supported Aurangzeb, who after ascending the throne conferred on him the title of Amir-ul-Umara, meaning "Chief of the Nobles. "in recognition of his loyalty and support. Aurangzeb who was convinced of his military capabilities, appointed him as viceroy of the Deccan, soon after his ascension to the throne, and sent him as the commander of a large army to defeat the Maratha forces led by Shivaji. Shaista Khan arrived in Aurangabad with his large army, in January 1660, and soon captured Pune, converting Shivaji's childhood residence "Lal Mahal"into his own residence. He also laid siege and captured the Fort of Chakan, and also Kalyan and north Konkan. The city of Pune and Shaista Khan's residence was well guarded, and no Marathas were allowed entry into the city without permission. It was under these conditions of tight security, that Shivaji drew up a plan to kill Shaista Khan, in which Shivaji himself entered the city of Pune, on April 5, 1663, with 400 of his fighters, disguised as wedding guests, having obtained prior permission to enter the city, as the bridegroom's procession. At midnight, the fighters gained entry into "Lal Mahal"overpowering the guards and breaking a wall. Shaista Khan was alerted by one of his slave girls. Shivaji himself entered Shaista Khan's living quarters and confronted the commander, who escaped through a window but not before he received a blow from Shivaji's sword that severed some of his fingers. In the ensuing melee, Shaista Khan lost his son and forty attendants and six women were also killed. By the time the soldiers surrounding the palace were alerted, Shivaji and his men had already made their get away, pursued by Shaista Khan's soldiers. The news of the daring raid on "Lal Mahal"angered Aurangzeb, who relieved Shaista Khan of his command and transferred him immediately as Governor of Bengal. Assuming duties as Governor of Bengal, Shaista Khan found that certain regions of the province including Chittagong were not under Mughal control anymore, and was ruled by the neighboring Arkanese kingdom, who also fuelled rebellions in the border region. At first Shaists Khan build up his army and navy to match those of the Arkanese, and with the help of the Dutch East India Company and the Portuguese, launched an assault on the Island of Sandwip, which was under Arkanese control, and captured it, in November 1665. Later, in December 1665 he launched a major land and naval offensive against Chittagong, that was led by his son Ummed Khan. At a great naval battle in the sea, the Arkanese navy was defeated by the combined navy of the Mughal forces, consisting of 288 vessels, and the Portuguese forces consisting of 40 vessels. The Fort of Chittagong was then besieged and captured on January 26, 1666. After re-asserting control over Chittagong, Shaista Khan re-named it Islamabad. After defeating the Arkanese, Khan ordered the release of thousands of Bengali peasants, who were held captive by them. Shaista Khan, despite being a loyal supporter of Aurangzeb, helping to maintain Mughal control over the distant province of Bengal, conducted an independent foreign and trade policy. He encouraged trade with Europe, Southeast Asia and other parts of India, and signed several trade agreements with European powers. However, he banned the British East India Company from Bengal after they demanded greater trading rights, sometimes leading to military confrontations between the two sides. Under his rule, Dhaka, the capital of Bengal, underwent massive urban and economic expansion, with the construction of modern townships and other public works. A great patron of the arts, he constructed many majestic monuments across the province, reflecting Mughal and Indo-Saracenic architecture, such as mosques, mausoleums and palaces. 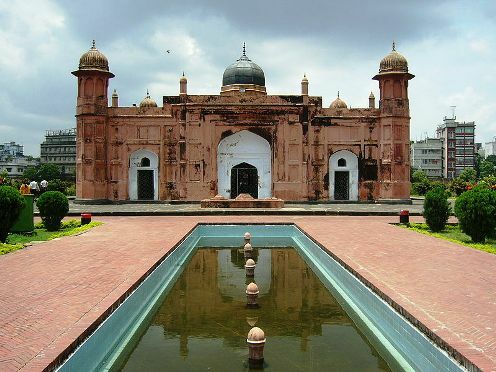 Some of the architectural monuments ascribed to Shaista Khan are the Lalbagh Fort in Dhaka, the Chowk Bazaar Mosque, the Satgumbad Mosque, the Chhota Katra, and the Bibi Pari Mausoleum, built to honor the memory of his beloved daughter who was betrothed to a Mughal prince, but died prematurely. The Shaista Khan Mosque, incorporating Bengali and Mughal architecture, built on his palace grounds, still stands today, a lasting monument to his contribution to the development of Bengal, protected by the Government of Bangladesh and a major tourist attraction today. 5) Pearls Described by Tavernier - Famous Pearl and Collections. The Book of the Pearl - George Frederick Kunz.